For the majority of Christians, the Holy Spirit (prior English language usage: the Holy Ghost from Old English gast, "spirit") is the third person of the Holy Trinity—Father, Son, and Holy Spirit, and is Almighty God. The Holy Spirit is seen by mainstream Christians as one person of the Triune God, who revealed his holy name YHWH ("I am who am") to his people Israel, sent his eternally only-begotten Son Jesus to save them, and sent the Holy Spirit to sanctify and give life to his Church. The Triune God manifests as three divine persons, in one divine Being, called the Godhead (from Old English: Godhood), the divine essence of God. 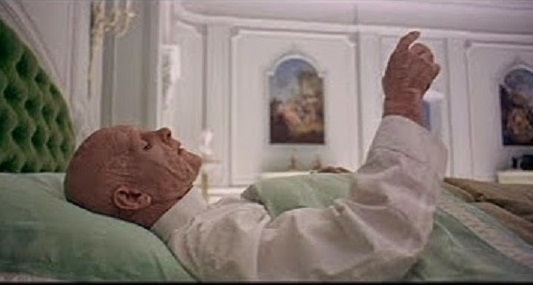 [a] Death of the Holy Spirit is being depicted in A Space Odyssey, as described below. 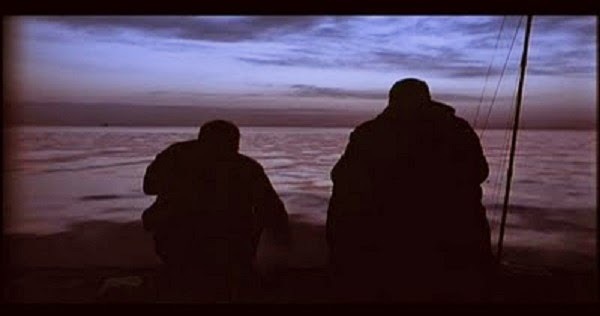 From Mann's Thief: Top left: Frank (left) and a fisherman sit on a jetty in a lake. This view is meant to portray the idea of the Holy Spirit moving over the waters at the beginning of creation, as told in the biblical book of Genesis, chapter 1, verse 2: Now the earth was formless and empty, darkness was over the surface of the deep, and the Spirit of God was hovering over the waters. [New International Version] Top right: Okla (left) is visited by Frank while in prison. 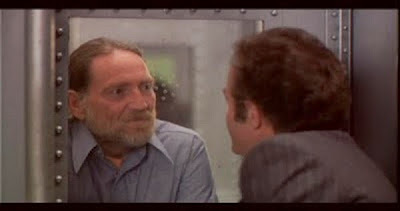 As discussed in the analysis of Thief on this blog, Okla represents Frank's guardian angel, which is a kind of spirit. Later, Okla dies from angina. The full name for angina is angina pectoris, which, translated from the Latin, means "a strangling feeling in the chest." In the bible's Gospel of John, chapter 20, verses 20-23, a correspondence is drawn between breath, and the Holy Spirit: 20. [T]hen the disciples rejoiced when they saw the Lord. 21. Jesus said to them again, "Peace be with you. As the Father has sent me, so I send you." 22. When he had said this, he breathed on them and said to them, "Receive the Holy Spirit." 23. "If you received the sins of any, they are forgiven them..." [New Revised Standard Version; emphasis not in original.] 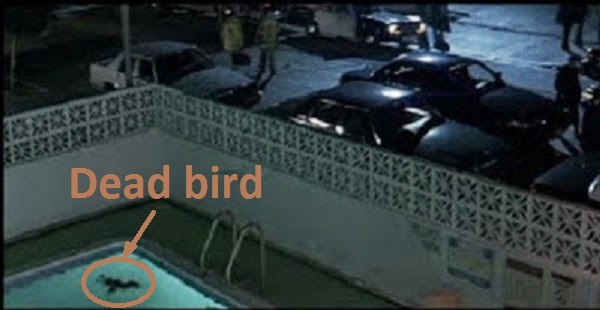 Above left: In the audio commentary for Mann's Heat, Mann says that he wanted to show a dead bird in the swimming pool (lower left of screencap) in this scene. Certain birds, such as doves, are sometimes used to represent the Holy Spirit. Above right: The last time we hear Bowman's breathing in 2001, he is pointing at the monolith just before he dies. The cessation of his breathing is meant to represent death of the Holy Spirit. a. Wikipedia, 'Holy Spirit in Christianity'. Web, n.d. URL = https://en.wikipedia.org/wiki/Holy_Spirit_in_Christianity.